President Mamnoon Hussain has urged scholars and literary figures to help revive Urdu as a medium of instruction at higher education and research centres. Addressing a ceremony held here on Saturday night to mark the foundation-laying ceremony of “Urdu Bagh”, a dedicated facility of Anjuman-e-Tarraqi-e-Urdu, Pakistan, he said nations strongly rooted in their culture and language were witnessed to be achieving heights in terms of social, economic and technological development. “We had a strong treasure and precedent set through Usmania University Hyderabad (India) where degree level courses including MBBS were offered in Urdu, through thousands of well-translated books,” he recalled. 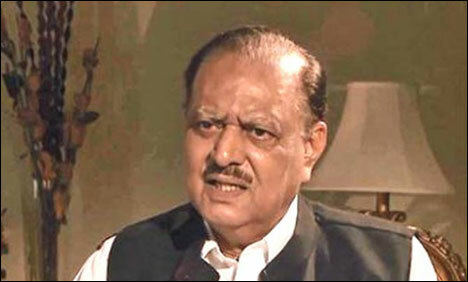 President Mamnoon said Anjuman-e-Tarraqi-e-Urdu should not only consider Urdu’s promotion as a mission but also take it as a challenge that higher education was imparted to the youth in the national language. Urgent attention was needed to strengthen Urdu as a viable link among the countrymen. It also required to be equally complemented through promotion of regional languages, he added. Tracing back the history of Anjuman-e-Tarraqi-e-Urdu established in 1903 by Nawab Mohsin-ul-Mulk, a close comrade of Sir Syed Ahmed Khan, he said the body established for protection and promotion of Urdu had paved the way for “Two Nation Theory,” unfolding into the demand for a separate Muslim state in the Indian Sub-continent. “This was not a mere co-incidence that men of caliber like Maulana Altaf Hussain Hali, Maulana Shibli Nomani, Allama Iqbal, Quaid-e-Azam Mohammad Ali Jinnah and Baba-e-Urdu Moulvi Abdul Haq served as its board members at one or the other point of time,” he added. Regretting that 60,000 books carried by Baba-e-Urdu from Hyderabad Deccan (India) to Pakistan along with several precious manuscripts and publications that despite being property of Anjuman Tarraqi-e-Urdu could not be adequately utilized, he hoped that the Bagh-e-Urdu Project would duly serve the purpose. The president also expressed the hope that all those associated with Anjuman Tarraqi-e-Urdu would stand united and ensure that the organisation achieves the purpose and helps scholars as well as researchers. Sindh Governor Dr Ishrat-ul-Ebad Khan, on the occasion, referred to measures adopted to get vacated the Anjuman Tarraqi-e-Urdu property from the encroachers and getting Urdu Bagh project materialized along with dedicated facilities for research, library, conservation of manuscripts and relevant material. The Federal Government along with the Sindh Government would remain involved till the project was completed and also ensure that the objectives were achieved in the years to come, he said. Responding to the submission made by Honorary Secretary of the Anjuman Tarraqi-e-Urdu, he announced that the allocated grant to the Anjuman by Karachi Municipal Corporation would be raised from Rs 1 million to Rs 5 million annually. “I will also approach the Sindh Government to streamline the endowment fund for the organization in the forthcoming budget,” he promised. Karachi Commissioner Shoaib Ahmad Siddiqui termed the Urdu Bagh project an extremely relevant scheme and said Urdu Dictionary Board, which though was working in close coordination with Anjuman Tarraqi- e- Urdu, yet was a separate entity under the control of Ministry of Information and Broadcasting. “The Urdu Dictionary Board is devoid of any in-charge for long,” he said. Dr Fatima Hassan, Honorary Secretary of Anjuman Tarraqi-e-Urdu regretted indifference towards the organization and particularly highlighted the efforts made by Noor-ul-Hasan Jaffery (late), former honorary president of the Anjuman who after years of struggle managed to get a plot allotted in 1987 that was later encroached upon. She expressed her gratitude to President Mamnoon Hussain for taking interest in the project that was being completed fast track through active involvement of prestigious institutions, including NESPAK and Sindh Building Control Authority. The ceremony was also attended by Mushtaq Ahmad Yousufi, Zahida Hina and other known Urdu literary figures. The presentations were followed by recital of poetry by Rasa Chughtai, Naseer Turabi, Imdad Hussaini, Dr. Fatima Hasan, Anwar Shaoor and Dr Uzma Navaid.